A card full of LOVE with Franci! Franci here with you today with a love themed card feat some of the new gorgeous products!! First of all I created my card base out of white cardstock and I decorated the front using the new Circles of Life stencil and some distress inks. 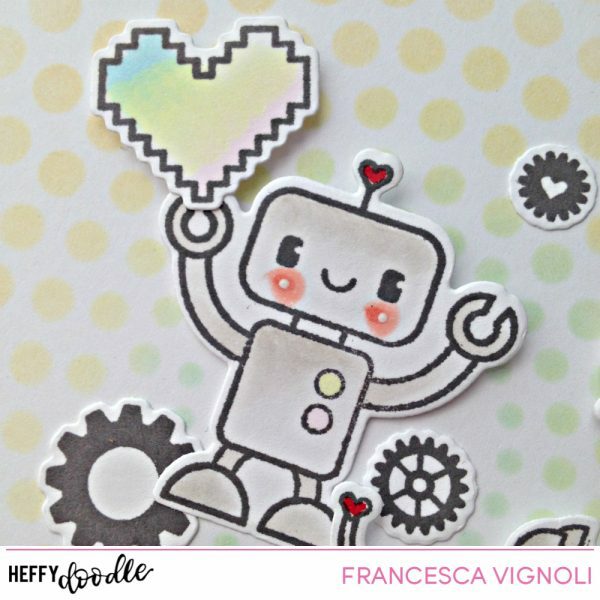 Then I stamped, colored and die cut these cute robot images from the Bots of Love set and the little mini set that was release for Creativation 2019. I die cut the love word out of some gold glittered paper, I also die cut a banner from the new Tag A long set and I stamped my sentiment on it. I glued everything down creating this clean and simple design and I’m so happy about how pretty it turned out!! I’ll create more simple card design like this throug the month, be sure to stick arounf for more inspiration!! Thanks for stopping by today and have a lovely day!